Perhaps as few as 20 000 to 25 000 years ago a number of large-sized animals roamed much of Australia, including the area around the Murray River region. Just what caused their extinction is unresolved, but both climate and human intervention were probably part of the answer. All that remains today are their small relatives, the kangaroos, wombats and the emus. 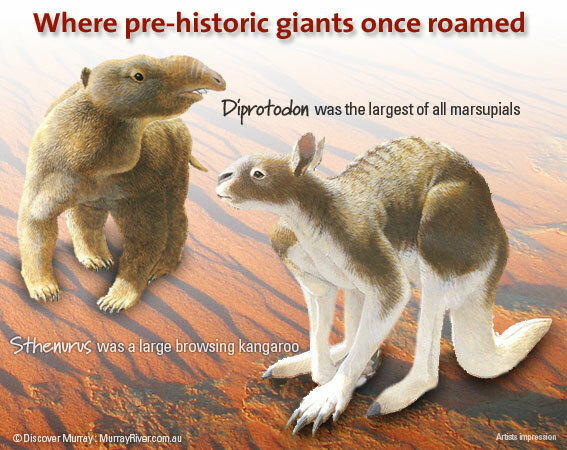 Diprotodon was the largest of all marsupials, an animal with no real modern counterpart. It stood about 2 metres at the shoulder and was 3 or more metres in length. Being a marsupial it most likely carried its young in a pouch. It grazed on rather tough vegetation that characterised inland Australia during the Pleistocene times (164 million to 10 000 years before present). At Lake Callabonna in eastern South Australia whole skeletons have been recovered. Trackways have been found on the surface of Lake Callabonna which show that the feet were covered by a big soft pad, such as in elephants. Diprotodon may have had a short trunk, somewhat like a tapir, but speculation continues amongst palaeontologists. The large head of the Diprotodon had a relatively small braincase, and the remainder was made up of relatively empty holes–probably a way of ensuring the large head was as light as possible. Within the skull was an impressive set of teeth, especially two forward-pointing incisors. Sthenurus was a large browsing kangaroo that lived for the most part in the savannah regions of the southern quarter of Australia, including the Murray River region. It was rather different to the kangaroos of today–it had a well-developed hand with a large thumb with little and middle fingers that were very long with long claws. Its arms were more manouverable than kangaroos’ of today, suggesting the animal could reach far above its head, probably to grab vegetation. Its cheek teeth were simple structures that were ideally suited to pulverising the softer leaves of bushes and trees – but not at all adapted to dealing with the tough silica-rich grasses that kangaroos, such as the big red, relish today. With a very short face, Sthenurus had binocular vision and was almost human-like in its facial appearance. Living alongside Sthenurus was a remarkable group of birds called the Mihirungs. Although thought by some to be just large emus, Mihirungs were probably at best only distantly related to them, but more likely related to the game birds such as Mallee fowl and scrub turkeys. The last surviving Mihirung, Genyornis newtoni, is the best known from Lake Callabonna although it roamed across much of Australia. It stood about the height of a tall human, perhaps slightly taller. Genyornis could not fly, and its wings were reduced to small structures. The legs were enormous in comparsion to the wings. It had unusually robust jaws–very unlike the emu, but nobody knows what their diet was. Genyornis did pick up stones, often preferring quartz pebbles, and swallowing them to use as gizzard stones to grind up food. Although their tracks and pictures have been recorded in Aboriginal rock art, we have little idea of their habits.